Seattle’s economic growth since the Great Recession might as well be called the Amazon Boom. But with Amazon’s gaze shifting to New York and Virginia, its newly chosen HQ2 sites, Seattle's economy could be in for something different. Amazon’s announcement that its headquarters expansion would land in New York City and Northern Virginia answered one question that had been hanging over the Seattle company. A big one remains for Amazon’s hometown: What happens next here? Seattle’s economic growth since the Great Recession might as well be called the Amazon Boom. Fueled by rapid expansion in online retail and cloud computing, Amazon grew into the biggest corporate tenant of any American city, becoming a center of gravity that drew thousands of well-educated, well-paid workers and other high-tech firms near the company’s home base in South Lake Union. The company’s construction and lease plans point to continued hiring in its first hometown for the next two years. After that, people who have spoken with Amazon executives and close observers of the company say, Amazon is likely to shift the bulk of its new hiring to its second and third campuses. That promises a drastic shift for a city that has grown accustomed to Amazonians moving in by the truckload. Between 2010 and 2017, the company added an average of 5,000 employees to its rolls in Seattle each year, not counting hires to replace departed employees. “Their expansion in these last four or five years has been kind of astounding,” said Michael Jensen, a senior planner with the Puget Sound Regional Council (PSRC), which works on regional growth issues. Exactly how much Amazon throttles back from that pace will have far-reaching consequences for Seattle’s economy, helping to determine the direction of the housing market, the makeup of the region’s workforce, and the fate of a construction boom that reshaped and expanded downtown, economists and executives say. Seattle city planners, restaurateurs, construction workers and advocates for low-income housing all have a stake in the plans of the city’s largest corporate resident. The HQ2 search makes one thing clear, observers say: Amazon grew up in Seattle, but it is no longer dependent upon it. Gov. Jay Inslee, speaking at an event at Amazon’s campus earlier this year, laid out the common view of Amazon’s heft with an anecdote about his son, Jack, a carpenter. “My son builds houses,” Inslee began. Exactly how much of a role Amazon plays in the Seattle economy is up for debate. But employment data suggest an outsized role for Jeff Bezos’ company. Amazon accounted for 29 percent of the workers Seattle added between 2010, the year the company moved to its South Lake Union headquarters campus, and 2017, according to an analysis of data from the company and city-level employment estimates from the PSRC. That share, large as it is, undercounts Amazon’s impact. Using government economic models, the company figures its investment during that period helped create an additional 53,000 jobs outside Amazon — positions in food and building services, construction, and suppliers of all sorts, part of a $38 billion infusion into the Seattle economy. Nowhere has the effect of that influx been more hotly debated than in the housing market, where price increases led the nation for nearly two years, pricing out many residents in what had long been an affordable big city. Seattle-based broker Redfin last month wrote that much of the growth in the local housing market can likely be attributed to expansion by Amazon. 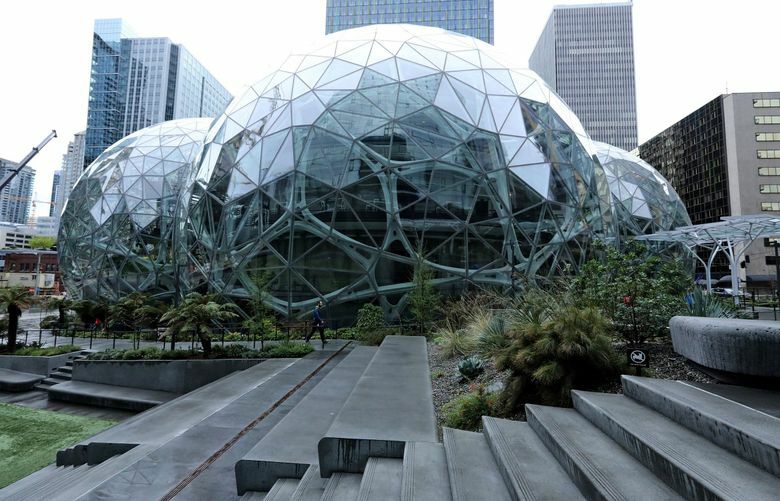 “Once Amazon announces the location of its HQ2 and begins hiring there in earnest, it will inevitably slow the Seattle housing market,” Redfin analyst Tim Ellis wrote. Assuming that the company halves the pace of its hiring in Seattle, and 5 percent of the company’s existing Seattle employees opt to decamp for HQ2, the supply of homes coming on the market would outpace demand, providing relief for buyers after a decadelong boom, Ellis said. Others disagree that Amazon is the chief force behind Seattle’s rapidly rising cost of housing. Complicating any analysis of the impact of HQ2 on Seattle is the fact that Amazon hasn’t offered much in the way of specifics about its plans for balancing life between Seattle and its two new headquarters campuses. The company said characteristically little when it announced its move to Crystal City, Virginia, and the New York City borough of Queens in a news release early Tuesday, saying only that it continued to hire in Seattle, and listing the number of open positions (about 8,000) and jobs here (more than 45,000). Jay Carney, who oversees Amazon’s communications and government affairs groups, said the new headquarters campuses were designed to capture future growth, rather than serve as places to relocate current employees. Amazon real estate plans offer other hints at the company’s growth trajectory. By the end of 2020, work will be finished on the company’s $4 billion Seattle headquarters campus. Along with other buildings under construction that Amazon plans to lease, the retail and technology giant will have room for about 55,000 people in the city at that point, a spokesman said. Amazon, by then, will be building out its presence in Northern Virginia and New York. Documents Amazon and elected officials in each city signed to firm up tax breaks and other considerations suggest that the company will start slow in its new campuses, adding a combined 1,100 workers to the two cities next year. That pace will pick up quickly, to about 3,400 in 2020, and 5,000 in 2021, essentially matching the pace of the company’s peak growth in Seattle in recent years. The company by then will also have more options to expand near its Seattle base, but outside of the city limits. Office space the company plans to occupy in 2020 in Bellevue and Vancouver, B.C., brings a combined 3,500 jobs, part of a hiring binge at satellite offices that will likely total more than 10,000 people in coming years. Others say a hiring slowdown at Amazon would be good for the area. “They’re at a size and scale where it wouldn’t be productive to double their head count here,” said Bill Bryant, a longtime technology industry investor and Seattle-based partner with Silicon Valley venture capital firm DFJ. That includes Seattle, a town that for decades was heavily dependent on Boeing, and saw its fortunes rise and fall with the order book of the airplane maker. Boeing’s recent retrenchment, which cut tens of thousands of jobs, would likely have been more widely felt in the Puget Sound region if not for Amazon’s rapid rise, economists say. Bryant and other technology industry observers say that even if Amazon’s demand for new workers slows, the region’s appetite for software developers — since 2016, Seattle’s most common profession — will remain strong. In contrast to the first years of Amazon’s rapid growth in Seattle, the company is joined today in its hometown by more technology giants. That includes Facebook and Google, both expanding in South Lake Union, and a raft of startups growing into midmarket companies, including many helmed by former Amazon employees. Microsoft, riding a cloud-computing resurgence, also continues to hire in Redmond. In any case, the luxury apartments and corporate office parks that stretch from downtown to Lake Union and beyond aren’t going anywhere, regardless of Amazon’s plans, the result of a multigenerational shift in Seattle from light industrial work and trades tied to fishing, timber and natural resources to software development.